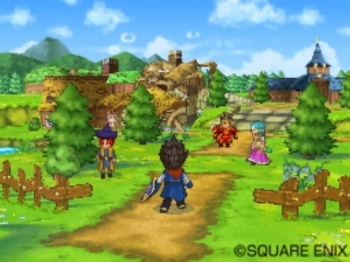 Dragon Quest IX's producer says the game took inspiration from some very Western titles. Don't let the anime art style fool you, Dragon Quest IX isn't a JRPG, at least not according to producer Ryutaro Ichimura. Instead, he said, it had much more in common with Western RPGs. "We have no recognition that Dragon Quest IX is a part of the so-called JRPG genre, unless you mean all the RPGs created in Japan are JRPGs," Ichimura said. Ichimura said that the game was different from previous Dragon Quest titles, as it had a focus on multiplayer, and a quest system that will feel very familiar to a lot of people: "The quest system was inspired by The Elder Scrolls IV: Oblivion, which I played many times. And I would like to reference Diablo as the title which inspired our thinking about how we can maintain player's motivations." Dragon Quest IX was released in Japan in July 2009 and sold over two million copies in its first weekend. The game is due to be released in the US on July 11th, and in Europe on July 23rd.